A mottled brown shell material with a spotted, striped, or sometimes even speckled pattern. Tortoiseshell is a material produced mainly from the shell of the hawksbill turtle, an endangered species. It was widely used in the 1960s and 1970s in the manufacture of items such as combs and sunglasses; however in the 70's the United Nations banned all trade of tortoiseshell worldwide. There have been a number of faux tortoiseshell materials developed since the 1970s, most of which mimic the appearance of tortoiseshell. 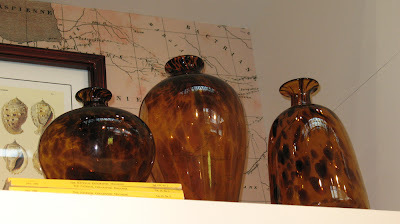 (above: tortoise shell vases, Two's Company, 914-664-2277). 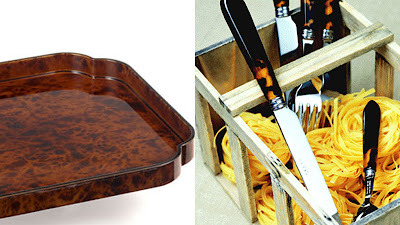 (l to r: Tortoise tray, $55.00, William Wayne & Co.; Tortoiseshell flatware, Sabre, cottagehomemaine). With its remarkable depth of color and tonal variation, the collection by Jaune de Chrome exemplifies their innovative glazes . Made in France of top-quality Limoges porcelain, each piece is wrapped with a tortoise border and edged with 24-karat gold. 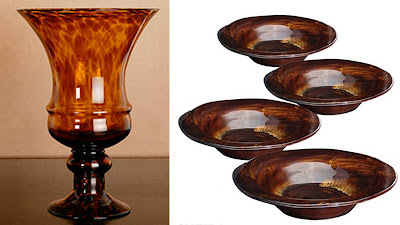 (l to r: Jaune de Chrome dinnerware, from $46.00, Gump's San Francisco; Tortoiseshell vase $9.99, Target). 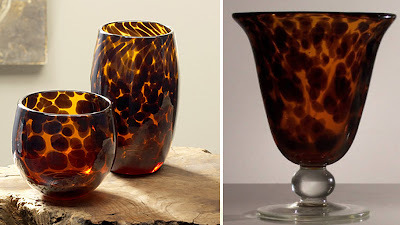 A quick décor accent - Place these tortoiseshell vases - either filled with flowers or as is - on any table as a stunning centerpiece. When light passes through the crystal, it will create exciting new dimensions in the tortoise pattern. 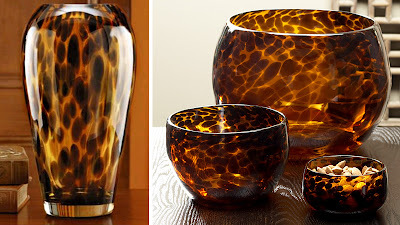 (l to r: Tortoiseshell vase, $43.20, Lenox; Tortoise bowls, starting from$14.00, West Elm). (l to r: Tortoise tumblers, $32.00, set of 4, West Elm; Tortoise short goblet, $9.60, Cocktail vibe). 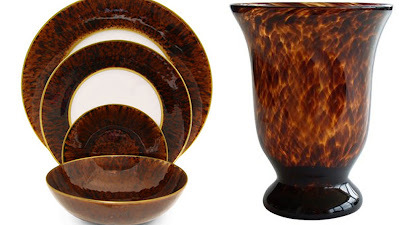 (l to r: Tortoise Urn, $29.95, Zgallerie; Tortoise shell soup bowls, $29.99, Oneida). Elegant by nature, tortoise glass gorgeously diffuses light and lends a rich warmth to a favorite table or fireplace mantle. These tortoise pieces are fantastic. I am loving the tray and the flatware. Do you know if the flatware can go in the dishwasher? Hi Patricia, I wrote to the firm that reps "Sabre flatware" here in the U.S. to confirm if it can indeed go in the dishwasher. Their reply was; "it most certainly can". Thanks so much for the inquiry. I also forwarded their response to your email address. Thanks for checking on this with Sabre and for your speedy response.